NOTD: Catrice Lala Berlin - CO4 Ruby Red - Cherry Colors - Cosmetics Heaven! I want to show you a beautiful red nail polish with a bit of a pink undertone. 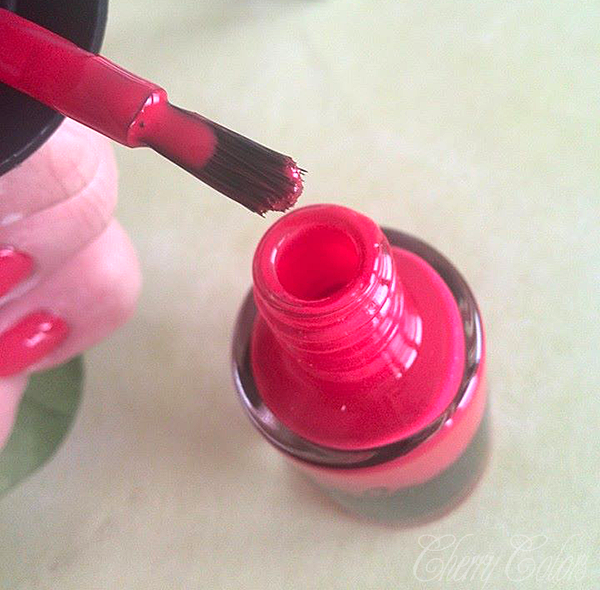 It is the Ruby Red from the Catrice Lala Berlin TE. The brush is utter crap. I usually like Catrice's brushes, but not this one. It is medium stiff, but spiky as a boar's back! I had quite a problem with the application because of it. But to save the polish, the formula is brilliant! Easy to use, glides on smoothly. The polish is a bit on the jelly like, but very opaque. One layer is all you need. Seriously, two layers won't make a difference, because it will look exactly the same as with one layer. Get it, if you can still get your hands on it. It is worth its price (3€).